Hi! I completed my PhD in the Computer Science Department at the University of Texas at Austin in May 2017. 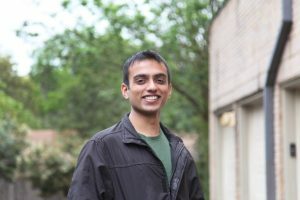 I received my undergraduate degree at the Indian Institute of Technology Roorkee in Computer Science and Engineering in 2009 and my Masters degree at UT Austin in 2011. I currently work at Cogitai Inc. I can be reached at piyushk AT gmail DOT com. At UT, I was a member of the Learning Agents Research Group under the guidance of Peter Stone. My research focused on advancing mobile robot systems in unstructured indoor environments. As part of my dissertation research, I developed multiple indoor Segway-based robots. Using these robots, I demonstrated how to use centralized probabilistic planning techniques based on Monte Carlo Tree Search (MCTS) to efficiently aid humans in the environment in real-time. During my time as a Ph.D. student, I also worked on UT’s autonomous vehicle Marvin and the RoboCup Standard Platform League (SPL). For a year and a half, I also taught an undergraduate course on autonomous mobile robots as part of the Freshmen Research Initiative (FRI). Copyright © 2019 Piyush Khandelwal.